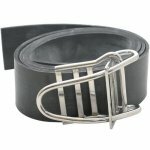 2” X 65” stretch heavy duty rubber weight belt with wire buckle. The Trident Rubber Weight Belt with Stainless Steel Wire Buckle is perfect for freedivers, as its rubber material automatically compensates for wetsuit thickness changes at varying depths with no need to make manual adjustments. Available in black only.